Monarch Air Group provides private air charter in Albuquerque, NM. Our clients benefit from top-notch service, unrelenting dedication to safety, wide selection of aircraft, and years of experience in chartering private jets. To obtain a free quote, please use our online quoting tool provided below, or call toll free 1-877-281-3051. 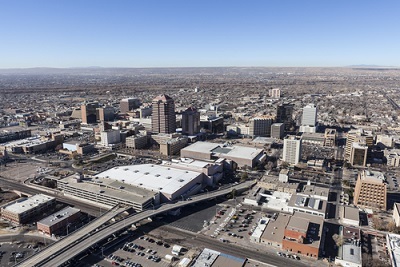 Albuquerque is the oldest and largest city in the state of New Mexico, US. Straddling the Rio Grande, and with the Sandia Mountains to the East, situated in the central part of the state. Albuquerque has many cultures like Native American, Hispanic, Anglo, Latino. It is science and technology center, which has the University of New Mexico and Sandia National Laboratory. The city has all possibilities for such activities as biking, skiing, and golf. Albuquerque is well known as the hot air ballooning capital of the world, which has during the month of October the Albuquerque International Balloon Fiesta. About 250,000 tourists each year come to see this celebration, and over 2000 registered air balloons making it the most photographed event in the world. 1. ABQ, Albuquerque International, Albuquerque, United States. 2. LAM, Los Alamos, Los Alamos, United States. 3. OTO, Vor, Otto, United States. 4. SAF, Santa Fe, Santa Fe, United States. 1. Holiday Inn Express Albuquerque Airport, 1921 Yale Boulevard Southeast, Albuquerque. 2. Holiday Inn Express & Suites Albuquerque Historic Old Town, 2300 12th Street Northwest, Albuquerque. 3. Andaluz Hotel, 125 2nd Street Northwest, Albuquerque. 4. The Hotel Blue – Albuquerque Downtown Hotel, 717 Central Ave NW, Albuquerque. 5. Embassy Suites Hotel- Albuquerque, 1000 Woodward Place Northeast, Albuquerque. 6. Hotel Albuquerque at Old Town, 800 Rio Grande Boulevard Northwest, Albuquerque. 7. Hotel Parq Central, 806 Central Avenue Southeast, Albuquerque. 8. Sheraton Albuquerque Airport Hotel, 2910 Yale Boulevard Southeast, Albuquerque. 9. Holiday Inn and Suites, 1501 Sunport Place Southeast, Albuquerque. 10. DoubleTree by Hilton Hotel Albuquerque, 201 Marquette Avenue Northwest, Albuquerque.